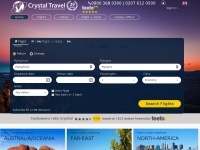 Cheap Flights - Book best travel deals from a wide range of flights, holiday offers to worldwide destinations, flight+hotel and travel extras from Crystal Travel. A total of 4 reviews for Crystaltravel.co.uk have been written yet. The most recent reviews are listed below. It was an excellent booking experience with Andy from Crystal Travels. He listened to all my queries and answered them patiently. I was given a better price than I had requested and I would definitely recommend Andy and Crystal Travel to all my friends and family. Good site, easy booking. Had doubts as i have never heard of Crystal Travel but was recommended I use cheapest flight. Can't cancel but that's my fault.... do research first on airlines and luggage allowances! Not happy about SAS. Wish I did my homework first but hey ho we live and learn. Taking 2 pieces of luggage with me, hope they arrive at my destinations ok. Even with the extras, the chosen flight is cheaper as my direct route has sold out on my chosen dates. I Mrs Damini Patel am writing about my experience with Crystal Travel. My Experience began on the 15th August 2016. Our Guru HDH Pramukh Swami Maharaj had passed away on Saturday 13th August 2016 and me and my family were very eager to go to India for the Last Rites of our beloved Guru to be held on the 17th August 2016 15:30 IST. I Damini Patel had been ringing around Travel Agents to get Tickets for Myself and my 2 children but to no avail. Finally, I called Crystal Travel and spoke to a very pleasant Young Man by the Name of Kane. I spoke to Kane regarding my concerns and that I wanted Tickets to go to India by tonight being 15th August 2016. Kane took all my details and told me to have faith and he will do his best to get me tickets so that I can be in India ASAP. Kane stated that he would get back to me as soon as he gets something for me and said I will call you back. Kane called me back in an hour and stated that I have got tickets for you and your 2 Children flying from LHR to Delhi then Delhi to Ahmedabad arriving in AMD on the 16th August 20:00 IST. The Price of the Tickets was within my Budget and Kane instantly booked the tickets for us also confirming our seats and our Dietary requirements. He explained that these tickets were One way as he was not getting any confirmation of Return flights by any Airline due to high demand and it also being School Holidays. He also stated that Ma’am don’t worry about your return I will make sure that I do all I can to get you return booking ASAP and that was his promise to me. Kane kept in contact with me from the time I got to LHR for my Flight to Delhi through Check-in and as I was boarding the Flight. He took great care of me and my 2 Children as I was travelling with them on my own. Note Kane was not a known person to me but whilst talking to him he made me feel special. As I Arrived in Delhi Kane again called to make sure that the journey was hassle free and that if I had any issues. I stated all went very well and now waiting for my next flight. He again called just before my next flight from Delhi to AMD and made sure that we were ok and that there were no problems in the Airport. I mentioned that due to his Magic all was well and that we were very comfortable and happy for what he has done for us. Kane also again mentioned that Ma’am I have not forgotten about your return tickets but be rest assured that hook or crook I will get you your return flights and will keep in touch with you. Due to Indian Festival Holidays I did not hear from Kane so I called Crystal Travel and Spoke to Kim that I would like to speak to Kane regarding my return booking as he mentioned that he will contact me but I have not heard from him (Kane) but she mentioned that Kane had not been to the office for the past 3 Days due to Personal circumstances. She stated that she would pass my message to Him and tell him to get in contact with me ASAP. In the meantime, my Husband also contacted Crystal Travel from the UK and spoke to Leo regarding my return flights and wanted to speak to Kane and stated that he was not in the office but would get hold of Kane and get him to ring me urgently. At around 23:30 BST Mr Patel my Husband received a message from Kane stating that he had been given messages from both Kim and Leo to contact him urgently. Kane stated in the message that he would go to the office first thing tomorrow morning and would sort out the flights for me and my 2 Children to come back to the UK. Kim mentioned that due to Kane’s personal circumstances he had not been in the office for the past 3 Days but due to his word and commitment towards his clients (passengers) he still put aside his problems and came to the aid of his clients. Kane is a very enthusiastic polite and very humble young man and has great pleasure in the job he does. He called me in the afternoon the following day and stated Ma’am I am very sorry for not getting back to you and was very apologetic and stated that he had been successful in getting me and securing 3 tickets for my return back to the UK. He emailed me the inventory and told to me check everything over and email him back so that he can confirm the booking. I went through the email and confirmed to Kane that all was ok and that he could go ahead and book the tickets for us. Kane booked the tickets and sent the e tickets to me as soon as I had confirmed with him. He did mention that the journey will be a long one but as I had mentioned to him on the phone that I had to be back in the UK by latest 6th September due to work commitments this was the best way for me to get home to the UK. The flight was from AMD to Delhi, Delhi to China, China to LHR on the 5th Sept 2016 arriving in the UK on the 6th Sept 2016 15:00 BST. Kane contacted me when I got to Delhi as there was a long hold of approx 12 Hrs to ask if he could be of any help and book us a Hotel as I was travelling with 2 children and Delhi was not a known location for me. I stated that we are ok for the length of hold and that if anything I would be in contact. Kane was calling me at regular intervals to make sure that we were ok and that if he could do anything more to make this length of waiting time go quicker but I said to him not to worry and that we will be fine. Kane made a final call to me just before boarding the flight from Delhi to China to make sure that all was ok and mentioned that the flight was delayed for 40 mins I thanked him for his concern and wished him all the best and that I will speak to him as soon as I land at Heathrow. We as a family travel to different countries throughout the year for short or long breaks and we have never had any experience with any travel Agent like Kane. He has showed his care and concern towards his clients and has been a great support throughout our unplanned travel to India. I would like to send my sincere thanks to Kane, Kim & Leo for all their help and concern for us. I would also be recommending Crystal Travel to my Family and Friends for tickets as this company has a lot of potential going further with the staff it employs. Our special Thanks to Kane for all his hard work, effort and great support he has shown towards us. Really good and helpful service, couldn't thank Lauren enough for looking into everything for me and giving me the information I needed. Not pushy to make you book at all, I went away and called back later it was all really easy and pleasant. Crystaltravel.co.uk presents an article about a specific topic.